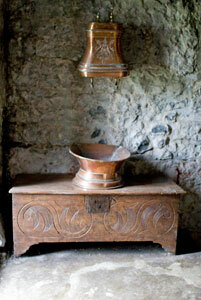 Knappogue Castle is a beautifully restored 15th century castle in the rolling hills of County Clare. 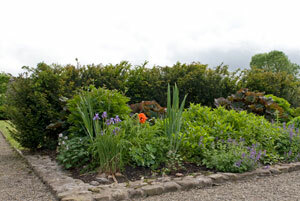 When you visit, make sure you take a stroll through the lovely walled garden. The castle includes a furnished drawing room, dining room, chapel, great hall and a banquet hall that features medieval dinners. Knappogue Castle is located in the Shannon region of Ireland in County Clare, near the village of Quin and the popular town of Ennis. The castle was built by Sean MacCon MacNamara in 1467 as a defense against the invading Normans. 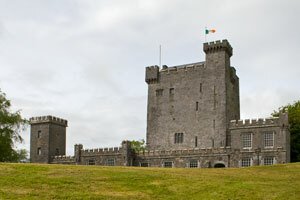 The original tower design was popular with Irish and Anglo-Irish gentry. The castle was owned by MacNamaras until it was taken by Crowmell in 1659 and granted to Arthur Smith, a "Roundhead." In 1670, the Monarchy was restored and the castle was returned to the MacNamaras. Francis MacNamara sold the castle in 1800 to a Scottish family. The new owners started restoration work and in 1855 the castle was sold to Theobald Fitzwalter Butler, the 14th Baron Dunboyne. Lord Dunboyne continued the restoration work. A local farmer owned the castle in the 1920s and it fell into disrepair. An American architect, Lavone Dickensheets Andrews, and her husband, Mark Edwin Andrews, bought the castle in 1966. They meticulously restored the castle in collaboration with Shannon Development. The Andrews were the last occupants on the castle. Shannon Development bought the castle in 1996 and manages it today. You may be interested to know that when the Andrews family owned the castle, Mr. Andrews began to collect casks of fine Irish whiskey. He had a large number of casks from the B. Daly Distillery and bottled it under the label of Knappogue Castle Whiskey. The last of the whiskey, Knappogue Castle 1951, is the oldest and rarest Irish whiskey in the world. Mr. Andrews' son brought the rare whiskey to market. For more information, visit the Knappogue Whiskey website. For a real taste of Ireland, go to the food ireland website and order some of the authentic Irish products. You will find the quality and service outstanding! For more Ireland travel information, you may want to order one of these two popular travel books from amazon.com. You will use them on every trip and enjoy them as you browse at home. 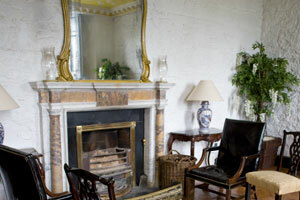 The five-bedroom State Room Apartment at the Castle is available for rent for parties of up to ten people. Medieval banquets with music, song, and dance are held from April to October. The castle is also a popular venue for weddings. 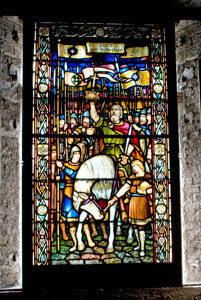 For more information, visit the Shannon Heritage website. The castle is located southeast of the village of Quin on the R469. It is 24 km (15 miles) from Limerick and 24 km (15 miles) from Shannon Airport. 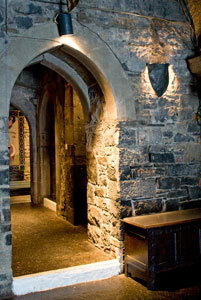 I'd love to send you interesting tidbits about Ireland and its castles from time to time. Please join our newsletter group by entering your email address below. I promise to use it only to send you Irish Castle Magic. 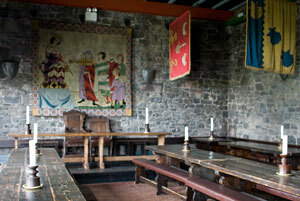 Visit Athenry Castle in Ireland and the historic walled town nearby. Gothic Castles are plentiful in the calm and scenic region of the Midlands and East Coast of Ireland. Visit the castles in northern Ireland and see the spectacular Giant's Causeway. Experience Belfast and the beautiful Glens of Antrim.